We realize the importance of having policies and even more so, the importance of being able to see that your families have accepted these polices. Whereas previously it was not immediately apparent that a family had a written acceptance on file, iClassPro now treats all policy acceptance equally, and marking that a family has accepted a written policy will satisfy the "current version accepted" check. 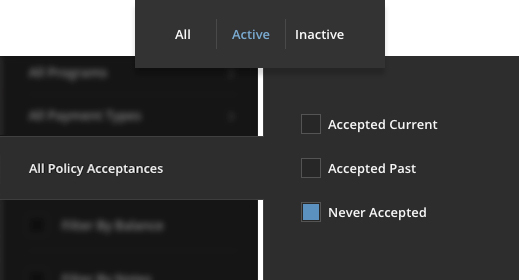 This makes it easier to see at a glance who has accepted your policies, no matter what the format! A filter option has also been added to the Families tab so that you can quickly distinguish who has and who hasn't accepted your policies. This makes it much more convenient to contact these families. Do you have families with children in classes that have never signed a waiver? If you find any families without a waiver, don't delay. According to our records, we don't have a current participation release on file for your child. Please help us by logging in to your account at your earliest convenience. We appreciate your prompt attention regarding this matter.